One of the most rewarding parts of our work is the opportunity to grow our business alongside our clients’ businesses. It feels good when clients give you additional work because they value your contributions and want your input moving forward. And we are thrilled to come along for the ride. Our work on regional franchise marketing is an example of the organic business development that has been key to our growth at 2 Moms Media LLC. Five years ago, we began working with the first Goldfish Swim School location in Chicago. As the Goldfish Swim School family grew, we continued to work with every new Chicago-area location to support their openings. Goldfish Swim School has grown significantly in the past few years and now we work with over a dozen Goldfish locations in Chicago on regional marketing efforts. Our regional marketing work for Goldfish has also expanded far beyond the Chicago market. 2 Moms Media currently heads up regional marketing efforts for the Goldfish Swim School locations in Cleveland, Philadelphia and New Jersey — with several other regional markets currently in development. Similarly, last year we had the opportunity to work with three Mathnasium locations in the city of Chicago. A year later, that work has evolved to include over 40 Chicago-area Mathnasium locations as part of a regional marketing effort. We’ve been able to take the strategies and tactics that have been successful here in Chicago and expand to include regional work for Mathnasium in other parts of the county, including Phoenix, Arizona and Orange County, California. So why is regional marketing on behalf of a franchise an effective use of marketing dollars? What makes this sort of outreach successful? How do we get so many different owners on the same page when it comes to collaborative marketing efforts? 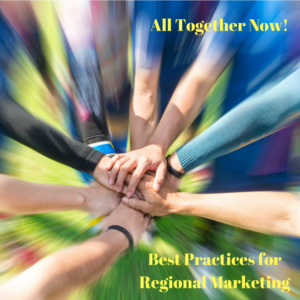 When it comes to developing and implementing successful regional franchise marketing campaigns, we’ve learned a few tips along the way. There is Strength in Numbers. As experienced marketers, we look at a situation where there are multiple franchise locations of the same business in the same market and we see obvious opportunities to join forces when it comes to buying advertising, placing TV segments, seeking earned media opportunities and building strategic partnerships. The reality is that if one location purchases an advertisement with a regional marketing outlet, all locations will benefit. So why not work together and share costs? The short answer is that small business owners in the trenches of their day-to-day operations may have very limited contact/communication with other franchise owners. Sometimes one owner operates multiple locations and the new guy on the block doesn’t know how to open the door to collaboration. Multiple owners likely don’t subscribe to the same philosophies or approach when it comes to marketing. Often times, some owners are willing to spend and others are simply not. The first step to organizing a regional marketing effort is demonstrating what is possible when locations pool their resources. An ad buy with the local PBS affiliate is likely cost prohibitive for one location….. but divide that cost by forty locations and it becomes feasible. Preview the possible collaborations to all stakeholders to demonstrate what is possible when you work together. Meet People Where They Are At. One of the other challenges to building a regional marketing effort is the fact that owners have different approaches to marketing. No two marketing budgets are the same. When putting together a regional marketing plan, recognize that you have owners in various stages of business growth and stakeholders who have different philosophies when it comes to spending marketing dollars. One of the most important parts of gaining consensus is recognizing ALL owners’ priorities and starting with a plan that can be a place of common ground. Begin with moderate spends where you can achieve strong results and build on those initial successes. Build Consensus. In order for regional franchise marketing to be truly effective, owners have to get on the same page when it comes to regional offers. For example, clear “call to actions” are key when it comes to advertisements. Examples of calls to action are things like “Book your free trial class,” or “Register now and receive $100 off your first month,” “buy our holiday package,” some sort of clear, uniform information to communicate to the consumer. Everyone in the region needs to be all in on these basic calls to action (or you risk causing harm to the brand if you communicate an offer that all locations won’t honor). Play The Long Game. The truth is that much of regional marketing is about building brand awareness. It can be difficult to convince some owners (particularly new owners) of the value of long-term regional marketing tactics versus activities designed to generate immediate sign ups or registrations. Regional marketing plans are always a long term effort. We are thinking about the brand now — and also five and ten years from now. As an example, for Goldfish Swim School, we think about maintaining the brand’s position as the best private swim school resource in the market. We work with tv producers on segments about water safety and other relevant topics. We place segments with multiple outlets and highlight what differentiates Goldfish from other learn-to-swim programs. Because they are now familiar with the brand, producers then come to us for information when water safety topics are in the news. Local affiliates run video footage previously shot at Goldfish when they cover water safety topics. Year over year, we maintain a consistent presence and build the reputation as the “go to” when it comes to water safety in the market. These efforts are cumulative. We are always thinking about ways to position the brand for the future. But Remember that Everyone has to Feel the Impact. The bottom line is that any successful regional marketing plan requires buy in from the majority of owners. It is essential to show how these regional efforts are impacting individual locations. As an example, for large scale regional events, we create a raffle card that collect entrants’ essential information — including their zip codes. Post-event, we are able to distribute the various leads to participating locations based on the zip codes. This data also helps us determine what events are a good regional fit moving forward. Despite organization and philosophical challenges, regional marketing efforts have proven to be a valuable use of marketing dollars. The benefits extend far beyond just collaborative marketing and PR exposure. These partnerships also help facilitate open communication and shared goal setting amongst owners. We host in person meetings with our regional marketing clients a few times a year. We are able to accomplish a lot during these face-to-face meetups! We can facilitate productive discussion and find common ground for those with opposing viewpoints. We leave these meetings energized about our efforts and future possibilities. We know that we are better off moving forward together. 2 Moms Media is a full-service boutique public relations and marketing firm that specializes in connecting brands with the parents who use them. 2 Moms Media believes in authentic outreach to its target audience through integrated marketing techniques. 2 Moms Media was founded in 2011 by Sara Fisher and Caitlin Giles and currently serves clients nationally in markets including: Orange County, Arizona, Chicago, Cleveland, Cincinnati, Minneapolis/St. Paul, Milwaukee, New Jersey, Atlanta, North Carolina, Philadelphia and more! For more information about regional franchise marketing efforts, please contact sara@2momsmedia.com.